im not a real human atm after such a long tiring day but i just wanted to wordvomit how amazing incredible brilliant fantastic troye was. nothing and i mean nothing in this universe makes me feel the way concerts do and i cherish that feeling immensely. it never goes over my head how privileged i am to have these opportunities and to live in a place that makes them so easy and accessible to me too. troye was and forever will be the soundtrack of my high school years. blue neighbourhood was there for me in the darkest time of my life. being able to hear those songs live, (almost) front row, in one of the biggest cities in the world, was both like coming home and kissing it goodbye. tonight was one of those full circle moments where you realise everything’s changed but it’s still very much the same. when you strip it all down to the basics, i’m still me. the world keeps spinning, people come and go, the backdrop changes, but through it all i’m still singing and dancing to troye sivan at the top of my lungs. alone in the middle of the kitchen in pjs making dinner, or at a big venue in central london with 5k other people. scared shitless at 16 or shitless scared at 20. no matter where. no matter when. i’m still me. i’m still me. finally got back to journaling for the first time in god knows how long. wordvomiting all that’s been in my chest for months onto the page has lifted a weight off me. i might not have any answers but i dared to face the questions at last...let spring come and with it the winds of change. i am tired of being caught up in the same old traps i built for myself. this post is so long overdue but i couldn't let 2018 go unnoted, and it's funny how i find myself struggling to find the words to write about it even though there is so much to be said. i've settled for this—a sort of retrospective rather than a re-cap. words make 2018 no justice, but bear with me as i try—one last time—to make sense of it. i'm thankful for the people of 2018. new friends pushed me out of my boundaries and old ones kept me grounded at times it felt the world was spinning out of control. and i'm thankful for london, forever and always, and all of the things that happened solely because i am here. see, the thing is—so many things that i don't even know where to begin. i will say though, perhaps the most surprising one was an unabashed capacity do be un-cynical. and this is something that needs (so much) work still, but it's there, somewhere, and i found it last year. getting a job and doing my best at it, no matter how insignificant it seemed. it was my first job and even though it was mind-numbing, i still learned so much with it. i've came out a better person out of it. emotional resilience (aka toughness) because this whole living-2-very-different-very-separate-lives affair isn't for the faint of heart. lff: all the process leading up to it, the funny anecdotes, the friends i made and how it felt to be there, to be doing that and how meaningful it was. i want to believe it was lff because it means it'll still be relevant then. making a film like i did for my tv module. it definitely set a precedent i don't want to let go of. not being so private about things that have no business being kept inside. i guess in a way i just became unapologetically me, even if it meant apparent change. i'm just not trying to be this well kept secret anymore. it's for the best. again, for the nth time, just living in london. walking around doing mundane stuff, like going to the supermarket and walking back home, or just going for a walk at the park, the tube rides i've learned to grow—just having all that take place here. going to bed hella late (no one said it had to be a good habit). writing, writing, writing, getting back to it, falling in love all over again, and realising i never want to not do it again. my lifestyle for sure. i moved out in 2017 but i only really settled last year, especially now that i'm renting and having to pay bills and commute. i think it went from 'oh wow i'm adulting' to 'this is just the way life is now'. i'd say the night of my sister's birthday when it was oddly warm and we all sat outside under the stars, listening to the crickets and just telling the most random stories. it wasn't deep or anything, but it just felt right and peaceful. also followed by a massive feels-fest with mags which felt like taking the cap off a soda bottle that had been being shaken for the past 8 months. don't get too caught up in having things neat and figured out. it's going to be so messy, but that's the fun in it. let go. control is appreciated but not necessary. you'll live and feel so alive. i want to leave behind self-doubt and self-manipulation, but also the kind of perfecticionism that leads to distrust. i need to be more flexible and reliant on myself and on others. paradoxically, to 2019 i want to carry the will to try new things and say yes more often, until it becomes second nature. so many beautiful things were brought to and into my life last year and i hope the next 12 months will be dedicated to nurturing them. the trip: the beauty in this is that i've travelled so much the past year, there's no straightforward answer. but maybe, the roadtrip in america because that was probably a once-in-a-lifetime kind of thing. it just occurred to me the year is almost over and i don’t want it to. i want to stay in 2018 forever. There are times when life happens so quickly there's simply no time to sit down and write about them. I’ve been trying to not be too hard on myself for not writing about certain things by making sure they’ve been well documented in other mediums. But now that october is coming to an end I think I need to really reflect on the past few weeks because there is no way I can let this month go unnoticed. On the 1st Michelle and I picked up the keys to our flat and then went for pizza and spent the night at my uncle’s. Uni started the following day and we came back, packed our stuff and after the sun had set we moved in to our new home, with nothing but a suitcase and a bottle of champagne. We order sushi and drank our champagne and took ridiculous selfies and we couldn't stop laughing, we weren't tipsy or anything, just the surrealism of it all was enough to drive us a bit crazy for the evening. The following day Jemma came to “help us unpack” and she talked and talked and talked and Michelle and her clicked so well–it made me so happy. She ended up spending the night, the first guest in our tiny sofa bed with improv pajamas and a random array of sheets. We’ve been here for 3 weeks and I’ve already lost count how many times she’s stayed over at this point. Less than 2 weeks later, Carline flew over and her and Jemma were back at my place for the night. I locked us out (which is always the first impression I strive for, ofc) so we just sat in the dark in the corridor waiting for my landlord to come and open the door for us. We just chatted as though we had been hanging out together for ages which in a sense we have. Then we made mac and cheese and waited not so patiently for the morning to come. Jemma woke me up at 5 and by 6:30 the 3 of us were out the door, with a bag full of snacks, piles of books and a pair of socks, ready to face what would be one of the longest day of the year. We got off at Piccadilly with the sunrising above the buildings, streaks of pink in the sky. And then we waited, we sat there in the middle of Leicester Square and let the hours pass us by and the city wake us up. And as we did, the butterflies in my stomach took flight too. It was 11:30 when security let us off and the 5 of us took off to have lunch. It was such a beautiful day; we walked through Covent Garden all sunshiny and bright and we had food and talked and everyone had a spring in their step. By 3:00, after a lot of waiting and worrying, we found ourselves front row in the pens and so did most of the amazingly lovely people we met that day. It was the most incredible, chill, happy, exciting vibe. Everyone there loved every second of it, I'm sure. And it felt like the past few months all added up to that—even before we saw him, even before anything had happened..so much had happened already that led to that moment, just being there, with those specific people, it felt like it really was just the cherry on top. 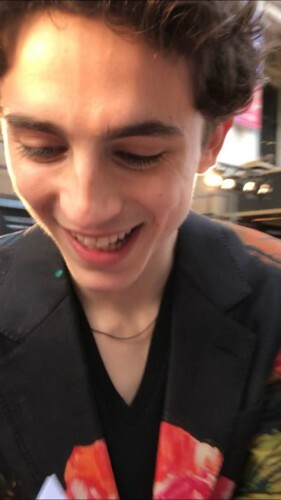 And then he arrived and brought that amazing, contagious energy with him, and he had fun and we had fun and the sun shone just for him, I swear, even the sunbeams got caught up on his eyes and reflected of his curls. He shone and so did all of we, despite the tiredness and the sleepiness, we wouldn't have had it any other way. He makes things so special and he made us all feel special too. Then we watched the film and I cried like a baby and of course was sweapt off my feet by his performance. When I wrote about meeting Timmy back in February I didn't dream I’d be doing it again just a mere 8 months later. Although a lot of things have changed (and some changed nothing at all) since then, I’m still struggling to find the right words to write about this experience or to write about him altogether. I keep saying that when of all the things I expected 2018 to bring me, a fandom was way down low on the list; yet I cant even fathom my life had not let myself fall (or rather dive headfirst) into it. So many things happened because of this, and so much of it has changed me for the better. Many of the people close to me right now and especially in London I met through CMBYN/Timmy and I'm so proud of that, because these are friendships I made solely by myself, by getting out of my comfort zone in this crazy city that so often feels ruthless but that's so blatantly generous too. After LFF, Carline stayed for a few days and we had the cutest time getting brunch and high tea and matching piercings and more pasta and sleepovers. Then they left and in a blink of an eye the whole thing was over. But October had no time to lose, so before I knew it I was picking Mags up at the station. We did touristy things and less touristy things, ate a lot of delicious food as we always do, played dumb games and had chill nights. But most of all, we went to see the Musical Bae, Tom Odell live. Man, I love him so much. It was so different from any other concert because I knew exactly what to expect and somehow it still managed to be better. I think in a way it felt like coming home, listening to these songs that have seen me grow up and have turned into the soundtrack of my teenage years. He said “London is the greatest city in the world” and then called it his adopted home and I Felt that. I knew exactly what he meant, I knew exactly what he was feeling because I was feeling it too. And of course it comes down to that, it always does. It's been a year and it still feels absolutely surreal that I live here. But yesterday I was thinking of missing home and it hit me that home doesn't feel any more home than London does. They're different homes with different meanings, but the feeling is the same. October really helped consolidate that because with all these people coming and going and staying over it felt like I was home. Navigating the tube by heart, taking my friends to secret spots, making plans in central—all the while it didn’t feel like the London from films or books or dumb BuzzFeed quizzes. First and foremost it felt like my city, my habitat. I lost count of the times I stopped for a split second in the crazy whirlwind of a month, looked around and thought "this is exactly the life of my dreams.” And I mean exactly. To the T.
one thing i really, really like each time is saying goodbye to my friends in the tube. "ok, i'm going this way." and then we hug and i always say thank you for coming and i mean it. like yesterday, after suspiria, claudia and i hugged twice and it was a proper hug, like a squeezy hug. or when michelle and i go different ways (rarely lol) and we say "see you later" and it's true. or jemma heading back south when i always go north, we hug and say talk to you later knowing that by the time we get to our platforms we'll be texting again. and i always end up thinking about it how the bakerloo line is my means of transport, like this tube line in london is my local public transport, and i ride the train with some music or a book or sometimes nothing at all, and in those moments just being here, existing here, breathing here, living in its most basic sense—it's enough.